Sizzling fun @ Playlist Live! , iJustine, Dan Brown, KassemG, Charles Trippy, and The Will of DC for our star-studded panel. We hope that our presentations on the importance of Google + integration, the changes to our suggested videos algorithm, and the exciting Next Vlogger program were useful to you. We have finally compiled our sizzle reel from the event. It was really hard picking the best moments since everyone was so enthusiastic and fun but here you have it! Thanks again and hope to see you all again soon! We just wanted to note how happy we were to see you all at Playlist Live in Orlando, and thank you for dropping by our booth! The YouTube crew had a really great time talking to you and chatting with Shay Carl, iJustine, Dan Brown, KassemG, Charles Trippy, and The Will of DC for our star-studded panel. Form to register is here. One of the ways that online entertainment continues to elevate creativity in production is in it's ability to directly interact and move to action it's audiences. But where does one find that audience and keep them coming back again and again? This panel offers guidance from some of the most successful audience-builders online entertainment has to offer. You've recognized the need to budget. But how do you budget for something you've never done before? Or how do you make your budget more effective than your last one? How much money will you need? Kathleen Grace will walk you through the do's and don'ts of pre-production, production, and post, as well as teach you amazing tips and tricks to create professional looking visuals for a fraction of the cost. Here's your opportunity to learn from our in-house YouTube budgeting expert and get your project off on the right foot. This workshop has been canceled - we'll post again on the Creator Blog when we set up Editing workshops in the future! Do you use iMovie 7 or want to learn to use iMovie 7? Would you like to take your editing skills to the next level? Find out how to create great cuts, graphics, and more magic to dice up your masterpiece projects! Editing 101 for the Web is a workshop where participants can improve their editing skills. Learn how to create fancy text, lower thirds, transitions, filters, as well as sound design to capture viewers’ attention. This workshop is ideally suited for beginners and intermediate level Editors who are either just starting out or those who want to improve their arsenal of skills! How is directing an actor for the camera different than on the stage? What's a good warm up for the actors to get everyone focused and communicating? How do I maintain an actor's performance when I shoot out of sequence? Directing for the Web 101 is a workshop where participants can share best practices, ask questions, and find out from the instructor great ways to get a strong performance from your actors. Ideally suited for beginners and intermediate level directors who are either just starting out or are interested in taking their directing to the next level. What is focal length vs focal distance? Why is lens speed important? How do I control depth of field? What are some cool tricks that I can use to light a scene with minimal resources? WHY IS ALL OF MY FOOTAGE BLUE???? Cinematography 101 reviews how you can use the technical to articulate the creative. Besides things like 180 degree rule and law of thirds, we talk about some of the mystery buttons on the camera that will help you improve your image as well as your understanding of why things work the way that they do. Ideally suited for beginners and intermediate level cinematographers who are either just starting out or feel that they need a better technical understanding of the mechanics of their camera. How do I promote my friend’s band? How do I turn myself into the next internet personality? How do I share the fun food that I make in my kitchen with the rest of the world? In class we look at successful examples as well as analyze what it takes to put together electronic press kits, podcasts and vlogs for YouTube. We review such concepts as B-roll, how to avoid talking head footage, and using links to build a network of like-minded people. Bridget Humphrey, Program Manager, recently watched "Celebrities Read Tweets About Themselves." We have lots of workshops and events coming up over the next couple of months, so wanted to let you know about these opportunities to learn new skills and best practices. Check them out below and register before they fill up! Attending Playlist Live this weekend? Drop by and say hi! Christine Wang and Sherif Hamdy,YouTube Partner Support, recently watched "5 year old tearing up the dance floor." The YouTube team will be in Orlando Friday through Sunday! Come by the YouTube booth to chat with members of our Partner Support team. Additionally we will be hosting a "Talk with YouTube" on Friday and a Partner Panel on Saturday. Monetize Lots of Videos - At Once! On the Video Manager, select videos you want to monetize by checking the box next to each video. You can currently select up to ten videos at the same time. In the Actions drop-down menu, select Monetize. This update will be available to all U.S.-based partners initially, but we’re rolling it out globally over the coming months. You can also find others ways that YouTube can help you discover your voice and improve your skills, build larger audiences, and monetize your content at the YouTube Creator Playbook 2. We’ve heard feedback from network partners that they wanted to be able to more easily share revenue reporting with their individual channel creators. We’ve also heard from these creators that they wanted to quickly be able to access this data. We understand that with more transparency and better data creators are able to make more informed decisions about their content. To that end, we’ve updated our reporting tools to allow networks to easily share revenue data with individual content creators if they so choose. If you’re a network, you can enable this feature by clicking into the CMS user management tool and selecting ‘enable revenue visibility’. Individual creators will then be able to see both their estimated NET revenue and additional viewership data in the Insight tool. Theo Luke, Content Partnerships, recently watched "Simon's Cat in 'Shelf Life.'" As you may have seen in your ads.youtube.com account, on April 12th, 2012, we will say a fond farewell to ads.youtube.com as we retire this interface. We’ve listened to your feedback and learned a lot about what video advertisers need to be successful with our tools. 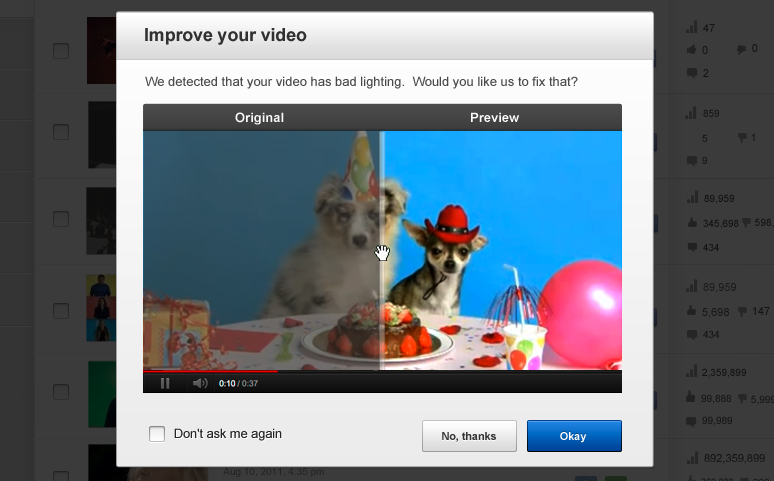 In an effort to give you more control over your ads, we’ve created AdWords for video (beta). This new tool streamlines the process of creating a campaign, has access to more ad formats and ad inventory, and gives you powerful tools to understand and improve the performance of your video ads. All accounts have now been transitioned to AdWords for video. What’s happening to Promoted Videos? This awesome YouTube video format isn't going anywhere - it's just joining the TrueView family of video ad formats with a fresh look. Promotions alongside YouTube search results are now known as TrueView in-search. Promotions alongside YouTube videos and content on the Google Display Network are now known as TrueView in-display. For more information about AdWords for video (beta), including a step-by-step setup guide, visit the AdWords for video website or or the AdWords Help Center. The last time you went channel surfing, did you enjoy (or remember) the 20 TV shows you flipped through, or just the shows you watched all the way through? Would you recommend the 20 you surfed through to a friend, or the ones you actually watched? To make the videos you watch on YouTube more enjoyable, memorable, and sharable, we're updating our Related and Recommended videos to better serve videos that keep viewers entertained. For years, the Related and Recommended videos we served to the right of the player and on the homepage represented our best prediction of what people wanted to watch next. We regularly tweaked the system that selects these videos to keep it evolving with the rest of the site. Today, this system serves videos based on the number of clicks they receive, which would be like suggesting a TV show based on how many people briefly flipped on a channel while surfing. But clicks aren’t always the best way to predict whether you’ll be interested in a video. Sometimes thumbnails don’t paint the whole picture, or a video title isn’t descriptive. We’ve been experimenting with the way we offer Related and Recommended videos, focusing on video engagement to get people to the videos they like more quickly. In particular, we’ve discovered that time watched is one of the best indicators of a viewer's engagement. As a result, we’ll be focusing more prominently on time watched in providing Related and Recommended videos starting next week. While we'll still be looking at clicks, engagement will become the leading indicator for serving these videos. So, if you’re making videos that keep people engaged, Related and Recommended videos will begin showing your videos more prominently. On the flip side, videos that don’t will not be surfaced as prominently, which will impact a video’s viewcounts over time. How can you adapt to these changes? The same as you always have — create great videos that keep people engaged. It doesn’t matter whether your videos are one minute or one hour. What matters is that your audience stops clicking away and starts watching more of your videos. To help you, we have an Analytics Audience Retention Report, a list of best practices, and answers to frequently-asked questions to find ways ranging from content to programming. As this kicks off next week, we’ll continue to share resources on this blog to help drive even more audiences to your videos and to your channel. In this fashion and beauty workshop, we'll hear from online fashion expert Amy Buchen and beauty guru Rachel Lightfoot, who will walk us through the ins and outs of fashion & beauty. Learn how to take your make-over and style-haul videos to the next level, and differentiate yourself from each other. We'll present best practices in the online fashion and beauty space, show you how to engage your audience in fun new ways, and give you tips on how to set-up an effective collaboration as well as engage fashion designers. In addition to our fashion expert, a YouTube Next Lab strategist will do a live workshop of some of your fashion and beauty channels with an emphasis on Audience Development. This event will be an excellent way for you to network with other fashion & beauty gurus. See ya there! Bridget Humphrey, Programs Manager, recently watched "The Arranged Marriage Song - NAVE feat. John Bala (Prod. by Deyo)."